Comparisons in most fields are inevitable.. the administrators, bureaucrats and the legislators must be provided with best of everything …… only Q would be whether such comparisons would be valid in deliverables, responsibilities, swift actions and deeds also !! There are news that our Indian President Pratibha Patil has been provided a Mercedes Benz S600L Pullman, an armoured car whose special protection features provide cover from military-standard small-arms projectiles and fragments from hand grenades and other explosives. Prime Minister Manmohan Singh uses a two B5-level armoured BMW 7 Series car. Newspapers articulate that the President's limousine has been upgraded after nearly eight years. Though Officials at Rashtrapati Bhawan and Mercedes Benz declined to comment on the issue, the cost of the car is estimated to be around Rs 6 crore. Reports have it that the new vehicle for the President was purchased around the middle of this year and it took one year to build the special-protection vehicle - whose safety features include the ability to run on flat tyres, a self-sealing fuel tank and a fire-extinguishing system. Rashtrapati Bhawan has purchased the vehicle to be used only by the President, the sources said. Mercedes Benz had showcased the S600L Pullman at the Delhi Auto Expo in 2010. The state limousine is equipped with a higher rear roof for easier access and greater headroom. Among other features, the car offers a special air intake system which can circulate fresh air even if there are poisonous gases around. In tune with the requirement of interaction on the move with State Guests and high level dignitaries, the seats are so designed enabling passengers sit facing each other. For privacy, there would be a partition between the driver's seat and the passenger compartment. In the United States, the presidential state car is the official state car used by the President. A variety of vehicles have both officially and unofficially been acknowledged as the presidential vehicle. Over the last century, US Govt. has specially commissioned vehicles for presidential use, often specifying advanced communications equipment, special convenience features, armor plating, and defense countermeasures. American cars are traditionally chosen for the role. The beast explained above is a recent one to be customized as the Presidential car. Besides there are two backup limousines previously used by President George W. Bush. When the President is on a trip, the limousine is transported in a C-17 Globemaster III. It is stated that the current Cadillac limo is the first not to carry a specific model name. The vehicle's outward appearance carries many current Cadillac styling themes, but doesn't exactly resemble any particular production vehicle. It is believed that the car is fitted with military grade armor at least five inches thick, and the wheels are fitted with run flat tires that makes the vehicle drivable for a certain period of time if punctured. The doors weigh as much as a Boeing 757 airplane cabin door. The vehicle's fuel tank is reported to be leak-proof and explosion resistant. The limo is equipped with a driver's enhanced video system which allows the driver to operate in an infrared smoke environment. Kept in the trunk is ablood bank of the President's blood type. Interestingly, there are no key hole in the doors. A special trick, known only to Secret Service agents, is required to gain access to the passenger area !! The United States government also operates similarly designed limousines for VIP guests, visiting heads of government, and heads of state. 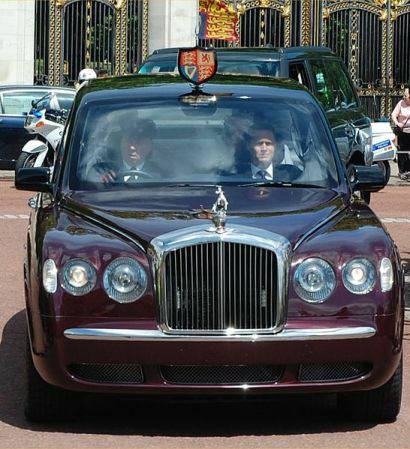 In Britain, the car for the Royal Queen is a specialized one with upholstery specially made 0f the lambswool sateen cloth made by Hield Brothers. Only two of these vehicles were built, making it even rarer than the Rolls-Royce Phantom IV, of which just 18 were built for royalty and heads of state. That is a Bentley used only on official engagements, and is always escorted by a selection of marked and unmarked Royal Protection Squad vehicles and local police vehicles and motorcycle outriders. When the Queen is on board, the Bentley "Flying B" hood ornament is replaced by Her Majesty's personal mascot of St Georgeslaying the dragon. So a royal car is a compulsory requirement for the Head of the Government – but … are their other functions and actions similarly accountable ?? I've read this put up and if I may I desire to suggest you some interesting things or advice. Maybe you could write subsequent articles referring to this article. I desire to read even more things approximately it! Hiya very cool website!! Man .. Excellent .. Amazing .. I'll bookmark your blog and take the feeds additionally? I am satisfied to find a lot of useful info here within the publish, we need work out extra strategies in this regard, thank you for sharing. . . . . . I'm glad that you simply shared this helpful info with us. Please keep us up to date like this. Thank you for sharing. I've been browsing online more than 2 hours today, yet I never found any interesting article like yours. It is pretty worth enough for me. In my opinion, if all website owners and bloggers made good content as you did, the net will be much more useful than ever before. I was excited to discover this site. I wanted to thank you for ones time for this particularly fantastic read!
! I definitely savored every bit of it and i also have you bookmarked to check out new stuff in your site. I know this site presents quality dependent articles and additional stuff, is there any other web page which presents these kinds of stuff in quality? Hello there! I just want to give you a big thumbs up for your great info you've got right here on this post. I will be coming back to your site for more soon. are masterwork. you've performed a great task in this topic! You've done an impressive task and our whole community will likely be thankful to you.